Even indoor pets can become troubled or lost, especially during times of natural disaster. The ASPCA offers an app that provides vital information about pet care before, during and after storms, as well as a pet recovery kit that includes steps on creating a digital flyer to share on social media. You can also store your pet's health records so they're easily accessible. PetSaver is like having a private vet at your fingertips. The app was created by the man behind PetTech, which provides pet first aid and CPR training. There are separate sections for dogs and cats with features including step-by-step instructions on first-aid skills and an emergency help locator. The Snout-to-Tail Wellness Assessment lets you create snapshots of your pet's health at different stages and email them to your vet. Every proud pet parent wants to share photos of his or her beloved dog. BarkCam is a canine Instagram that includes a selection of sounds you can use to get your dog's attention to snap that perfect photo. Personalize the picture with a selection of filters, stickers and quotes and share it directly from the app. Have you adopted an energetic puppy that needs to learn some manners? Experts recommend using a clicker for effective training, and this app offers several different clicker sounds so you can find the one your pet responds to the best along with valuable tips from professional trainers. Want to grab a bite to eat or head out on vacation with your best friend? BringFido helps you locate pet-friendly restaurants, hotels, beaches and hiking trails along with pet-centric services such as groomers, trainers and sitters. There is even a section listing pet policies for major airlines. Add your own reviews and post listings of new pet-friendly facilities you run across. Eliminate separation anxiety for both of you with Dog Monitor, which allows you to virtually be with your pet 24/7. This amazing app lets you talk to your dog remotely and watch live HD video, receive alerts when your pet is barking or acting up, and record commands in your own voice to keep him in line. 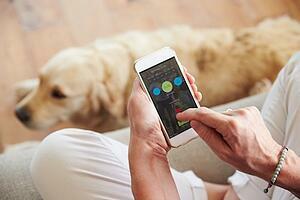 Dog Monitor is multi-platform so you can use it on watches, TVs and other smart devices. You don't need an app to find the off-leash dog parks and pet spas at our pet-friendly Springs luxury apartment communities. Spend some quality one-on-one time with your precious pet or socialize with other dogs and their humans.